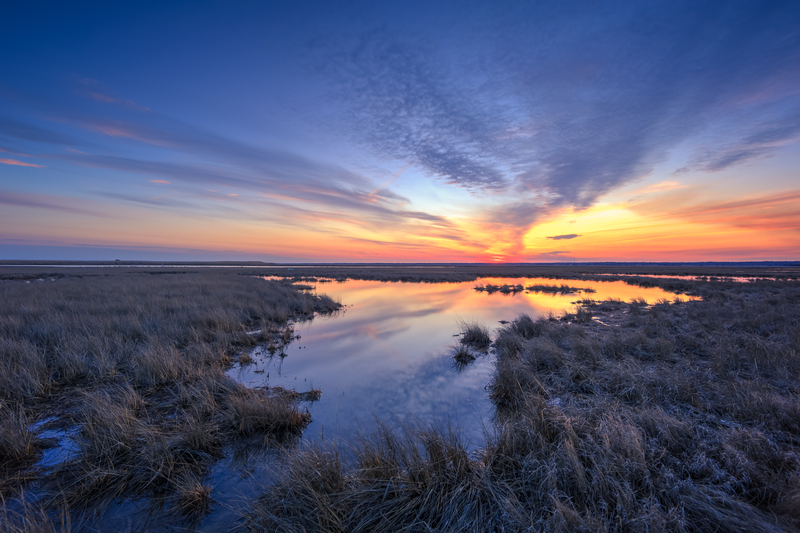 Things were quiet on the salt marsh tonight. A subtle blue hour affair in our slow march toward spring. While the calendar insists spring starts tomorrow, winter has other ideas. And so here I sit griping about three backloaded winters in a row. Backloaded meaning winters that will—not—end. March 2018 has been active with coastal storm after coastal storm. Wreaking havoc with rain, snow, sleet, thunder, lightning, flooding, and power outages. Most of which happened at the same time. This spot I made photos tonight has been underwater quite a bit this month. And now here we are, set to welcome spring with a winter storm watch. Wash. Rinse. Repeat. Le sigh. Now if you’re thinking, wait a minute, Gregory Hypocrite, I thought you loved snow? Well you’re not wrong. But while I love snow I am not its biggest fan once March hits. I am all about furious rates of maximum dendrite growth from December–February. But once March rolls in, with longer days and all its hopes for spring and summer I am ready to move on dot com. Yet again, as it was in 2016 and 2017, it looks like we are going to have to wait. As it is, winter holds.